Come Party with the Big Dogs at the River Walk! The Humane Society/SPCA of Bexar County and the Grand Hyatt San Antonio have joined together to honor the new El Rey Fido and Royal Court. April 11th from 1 p.m.-2 p.m. the 2009 El Rey Fido will be crowned and the Royal Court presented with a celebration at the Grand Hyatt San Antonio, 600 E Market Street. To kick off Fiesta, bring along your canine companion and enjoy the view at this beautiful dog friendly hotel, as our 4 legged guests make a grand entrance on the Rio SA River Barge. We are proud to announce that Sonny Melendrez, a well-known Radio-TV personality, will be the Master of Ceremonies again this year. Also, the Grand Hyatt will unveil its first ever Fiesta medal to congratulate the new El Rey Fido Court. Complimentary food and doggy biscuits will help make this a “Royal” day. El Rey Fido Info: Animal lovers throughout San Antonio entered their canine companions into the 7th Annual El Rey Fido Contest to raise money for shelter pets. The winners will represent the Humane Society as ambassadors at various Fiesta events, including the Battle of Flowers Parade. A current photo for State Rep.Trey Martinez Fischer's daughter Francesca!!!! Will Brassard invites you to his annual Fiesta Party which this year is a fundraiser for Elena Guajardo's campaign for City Council District 7. The party will be held at Will's home in a beautiful garden setting. The evening features a cocktail hour and sit-down dinner with a specially catered menu. The $35 suggested donation includes dinner. Seating is limited for this very special event, so make your reservation now. 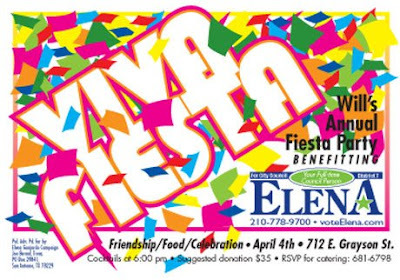 Will Brassard's Annual Fiesta Party To benefit Elena Guajardo Campaign, April 4th at 712 East Grayson St. Event begins @ 6 p.m. Suggested donation $35. Political adv. paid for by Elena Guajardo Campaign, Joe Bernal, Treasurer, P.O. Box 29841, San Antonio TX 78222. This is the premier issue of The Overnighter, giving you quick “Track & Trend” insights into the top issues being covered by the conservative blogosphere nationwide on a daily basis. The Overnighter contains the vital statistics about issue and newsmaker coverage and commentary from the more than 74,000 members of the NetRightNation.com conservative bloggers coalition. At a glance, you'll know what's Hot, what's Not, and what's on the Horizon. In addition, The Overnighter will allow you to quickly access blogs on the issues and newsmakers in all three of the above categories. This is the first comprehensive service to offer such a birds-eye view of the blogosphere. Please feel free to offer us your comments and questions. The Young Conservatives of Texas (YCT), the largest, nonpartisan and most active youth conservative group in the state, with nearly a three-decade history of activism, are hosting their 29th Annual State Convention in Austin, Texas on April 3rd – 4th at the Doubletree Hotel, located at 6505 IH-35 in North Austin. YCT has been very influential and active in the past year. Recently, their Legislative Agenda made headlines with their fight to keep tuition affordable. Chapters across the state continue to fight for conservative principles on their campuses, as well as in Austin. The convention will feature speeches and panels by influential leaders in Texas politics and the conservative movement, including Governor Rick Perry, who will address the convention on Saturday, April 4th, at 4 p.m.. Former United States Treasurer Bay Buchanan, who served in President Ronald Reagan’s Administration, will deliver a keynote address on Saturday, April 4th at 7 p.m..
“We also welcome newcomers to this convention to learn more about YCT and what we do. This is a great place to meet like minded conservatives and make new friends,” added Tony McDonald, Vice Chairman of Legislative Affairs. Other speakers include representatives from the National Republican Senatorial Committee, Empower Texans and Americans for Prosperity. State Representative Wayne Christian will address the students. Ted Cruz, former Solicitor General of Texas will deliver a lunch keynote address. Former Secretary of State Roger Williams will open the convention with a reception on Friday, April 3rd at 7 p.m.
Sponsorships and booths are still available by emailing lauraelizabethmorales@gmail.com. A complete agenda can be found at www.yct.org. Meet & Greet, Wednesday, April 1st from noon-3 p.m. @ the Garcia residence, 2411 Rivas St.
Saturday, April 4th from noon-4 p.m. @ 2411 Rivas St.
For more info or large orders please contact the campaign (210) 341-9904 - Garcia Ins. Agy. Endorsement meeting for the 1st time, the Bexar County Young Democrats will endorse in city council elections. Eight candidates have confirmed they will attend our meeting, two more have indicated a possibility of attendance. At the last meeting Mayoral Candidate Julian Castro, a representative of Mayoral Candidate Trish DeBerry, and City Council District 5 Candidate John Carlos Garcia addressed the membership. The candidates will have addressed our organization to ask for our support. It is now time to decide who we, the young Democrats, support and what direction we want for the city of San Antonio. District 8 candidates Mike Berlanga and Melissa Martinez-Carrasco have also indicated the possibility of attendance. Remember we are meeting at a new location. Joe's Crab Shack. For more information view the calendar of events below. Trish will be joined by the other mayoral candidates tomorrow on KTSA (550 on the AM Dial), from 7 a.m. to 9 a.m. Please listen in, and feel free to call-in with questions/comments.The call-in line is 599-5555.If you want to listen online, click here. Please be reminded that the Hispanic Heritage Center of Texas Committee Meeting for the Extravaganza Kickoff will take place on April 1st from 6-9 p.m. The meeting location is 231 W. Commerce at the AT&T Community Centre at San Fernando in the Espada Room on the second floor. Faith Outreach Center hosted a candidates forum, Sunday, March 28th @ their church on Sunshine Ranch.